"And another thing, we could be mistaken for mice and I don't fancy being part of the cat's diet!" The cat looses interest and wanders off???? Worst cliffhanger cop out EVER! We've got great model & set work again, especially the fly model which moves albeit while standing still but it does considerably add to the realism. But it is a more than a little slow moving compared to the first episode. 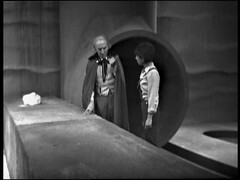 The "Tardis in a Land of Giants" idea had been thrown around since the earliest day of Doctor Who when CE Webber proposed it as an idea for the first story following on from the opening episode. 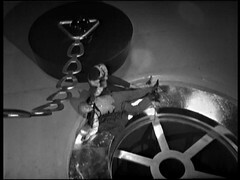 The idea passed through a number of hands before it was finally written as the debut script by Louis Marks (not to be confused with Louis Marx, the manufacturer of Dalek toys in the sixties!) Marks would return to the show to write a number of stories for Jon Pertwee & Tom Baker in the Seventies. Why then team were so keen on the giants idea I don't know,perhaps one of them was a big fan of Gulliver's travels. Two of the most obvious possible influences Irwin Allen's TV show Land of the Giants (first broadcast September 1968) and the film Fantastic Voyage, released August 1966 are some way in the future at this point. On the left we have Reginald Barret joins the cast this episode playing Smithers. He's got a long CV stretching from the early 50s to the late 70s. I am now duty bound to say "Release the Hounds". 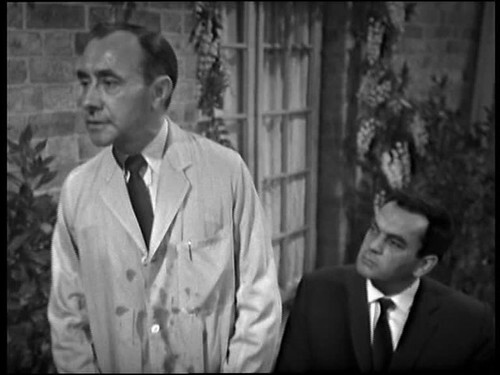 On the right is Alan Tilvern, playing Forester, who has a string of genre credits to his name including UFO:Confetti Check A-OK as the U.S. Delegate, the innkeeper in the 1978 Lord of the Rings film, as R.K. Maroon in Who Framed Roger Rabbit and two appearances in Dad's Army. 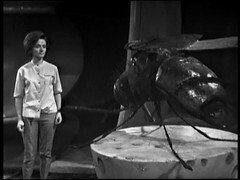 We get to see a giant fly in this episode: Planet of Giants represents the start of Doctor Who's love affair with Giant Insects. They'll be more, much more, later this season in The Web Planet with the Zarbi, Menoptera, Optera and Venom Grubs. There's giant maggots and flies in The Green Death, the insect like Wirrn in The Ark In Space, the Tractators in Frontios and even the new series has had a go in the Unicorn & the Wasp. We've had giant Crabs in the Macra Terror, a giant robot in Tom Baker's debut story, a giant virus in the Invisible Enemy, and even a giant Cyberman, my son's favourite The Cyberking, in the Next Doctor. We've also seen people shrunk again in Carnival of Monsters, Invisible Enemy and Planet of Fire.... and of course a great number of victims for the Master's tissue compression eliminator!